T.J. Oshie found his father on the ice amid the jubilant madness of the Washington Capitals' postgame celebration and wrapped him in a fierce hug. Five years after he was diagnosed with Alzheimer's disease, Tim Oshie's memory is inconsistent and cloudy. Anyone who saw the depth of emotion in his Stanley Cup-winning son's eyes Thursday night will never forget it. Right after Oshie won his first NHL title in the Capitals' 4-3 victory over the Vegas Golden Knights, the veteran forward's thoughts were on his family -- particularly his father, who fostered his son's love of the sport as a coach and a hockey dad in Everett, Washington, north of Seattle. "My dad, he doesn't remember a lot of stuff these days," Oshie said, his voice choking with emotion. "He remembers enough. But I tell you what, he's here tonight. I don't know where he's at, but this one will stick with him forever. You can guarantee that." The Capitals' Stanley Cup victory was a crowning achievement for the 31-year-old Oshie, a 10-year NHL veteran with stops in St. Louis and Washington after beginning his pursuit of the sport in the Pacific Northwest, which doesn't produce pro hockey players in high volume. Oshie said he couldn't have done it without steadfast support from Tim, who served as a coach for one of T.J.'s childhood teams in Everett. They both later moved to Minnesota for T.J.'s high school career. 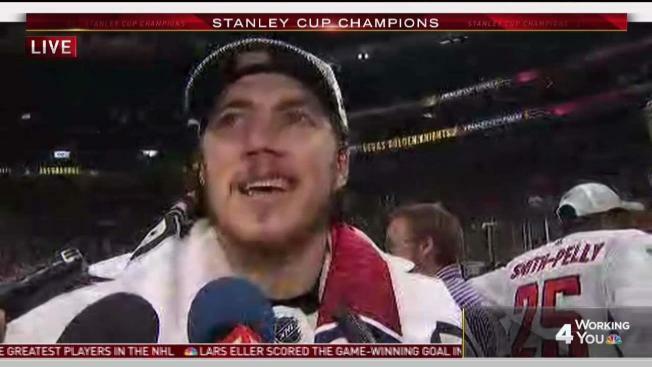 "To have him here is amazing,'' Oshie said of his father. "He doesn't travel very well, and I've been trying to figure out how to get him out all playoffs. It was kind of a perfect storm to get him with my aunt and sister out from Seattle." "Besides my family, that's one of the best feelings I've ever had," he said. "It's for my family. For my two little girls. I got my name on something so they'll know that dad played hockey when they grow up." Oshie's already strong popularity among Caps fans got a boost last week when he took Washington's public Metro trains to Games 3 and 4. His heartfelt love for his father will be another indelible memory of the Caps' championship season. "His memory is slipping a little," Oshie said. "This is one memory that I don't think he's going to forget."